When a DJ and a Comedian gets Married you know it is gonna be a good one. These guys smashed it from start to finish. 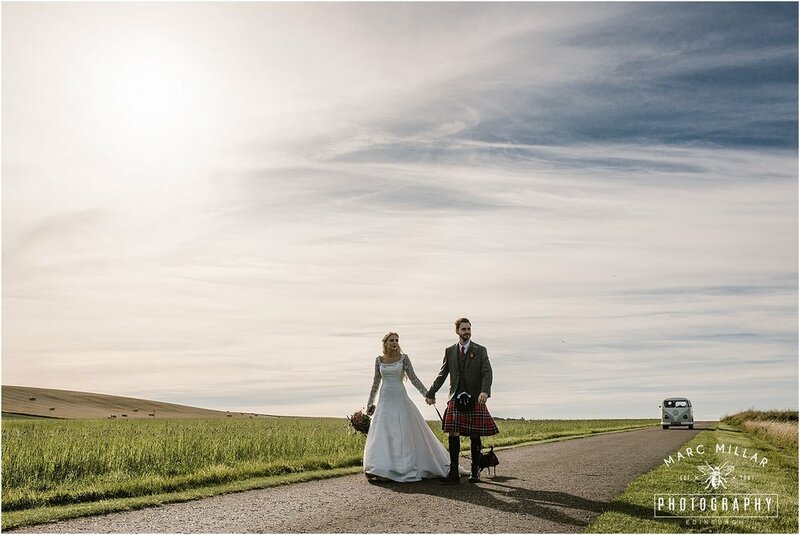 Kinkell Byre was the perfect setting - It's not every wedding morning I get to chase a bunch of half naked girls through a hayfield but rather that than the kilt flashing guys on the beach - thanks to Carley Buick (my second shooter) for this. Tim Maguire performed a beautiful, funny and moving ceremony in an amazing space of the byre with thousands of fairy lights. Alana's dog Pongo even gave his blessing right on cue. Alana and Luke hired a VW camper to hit the beach straight after the ceremony. The weather was perfect and we found a great wee beach not too far away. Shoes abandoned I just snapped away as they ran around the beach for a bit. Eileen from Sugar8 films came along with a classic old School super 8 cine camera - I cannot wait to see her footage. After getting back to the drinks reception we shot a few groups next to the big red barn doors which was a lot of fun. During the speeches I usually hide behind my camera to hide any emotions and this was no exception. As the meal was finishing the light was perfect and I was pleasantly surprised when they decided (coaxed) to ditch the coffee and head out for some sundowner shots. 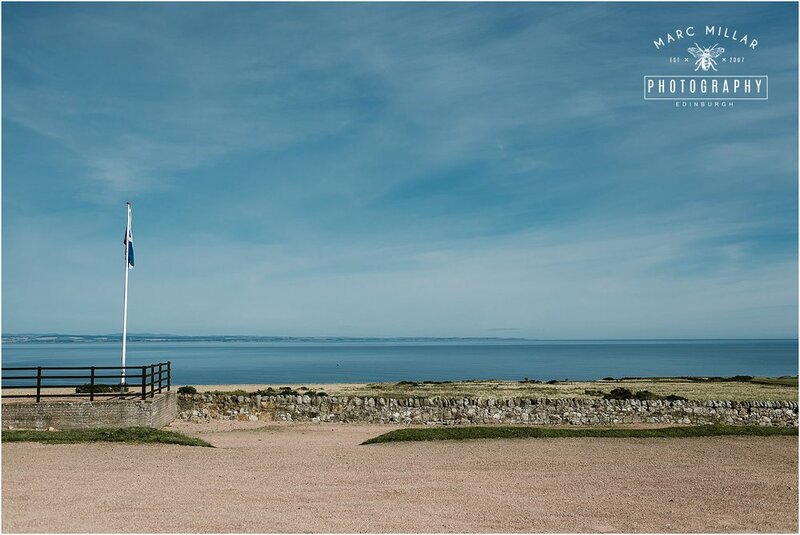 We found the highest point outside looking down onto St Andrews and got some great romantic shots - however Luke was doing some serious Lion King impressions at the time. Was great to see Mercedes and Agnes from Scarlet and Bell who kept everything on time and they set up the venue beautifully. Such an amazing day with cracking banter -even made me change over from Radio 6 and listen to Alana and her twin sister aka The Mac Twins on Virgin Radio which just happens to play every Saturday usually around the time I am driving home from a Wedding.